Those of you that follow Thelavenderbarnltd on Instagram will have already seen snapshots of my day in London with the Hair Salon Four in Mayfair. 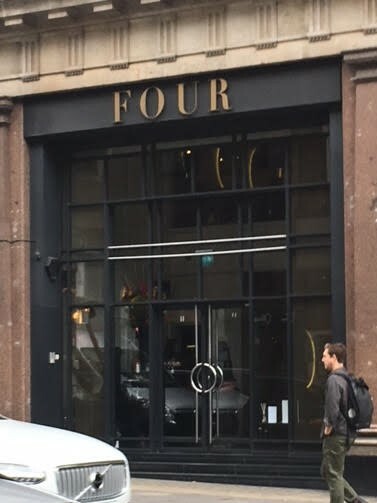 Just to give you a background on Four, the salon is renowned for being the place to go for colouring, Named Four after four of Mayfairs leading hair colour specialists the salon is home to many famous faces including Nigella Lawson, Tess Daly, Yasmin Le Bon and David Jason to name a few. The salon is famous for its hair colouring skills as many stage and screen stars need drastic colour changes whilst still maintaining a healthy head of hair ! My visit started by being greeted with smiling faces at reception, I was a little early which was great as it allowed me to sit on the sumptuous velvet sofa and get a look around while feeling the atmosphere, the salon is on 2 levels, with the upper level having an open gallery looking on to the lower floor, the place is filled with the most stunning floral displays everywhere you look and has the friendliest buzz of happy busy people, I often find that salons especially in London can be hugely intimidating, not so with Four it was comfortable from the moment I stepped through the door. Before being introduced to my Colourist Luci Green, I was draped in a gown and my handbag was placed into a huge cotton dustbag to protect it from hair and colour, a nice touch that I had never seen before. Luci greeted me with a smile introduced herself and led me to the upper floor, we discussed what I had in mind, the condition of my hair, and how much time I had to upkeep a new style, this under normal circumstances for the salon would be done as a consultation, Luci and I had spoken on the phone previously and she had seen photos of my existing cut and colour, which as you all know is grey. Showing me her Ipad with lots of ideas on colour, it was decided that I would have an all over bleach as I wanted my grey to be more silver and a lot lighter, something that I had always wanted but as yet been able to achieve. Luci then introduced me to Tom Tsang who was going to cut and style my hair, Tom decided to cut the bulk of my hair style before colour and would come back to me after Luci had done her magic, and magic she certainly did, every single step of the way, included bowls upon bowls of fresh bleach for each section, Luci said that she liked to keep the product fresh throughout the process, I was left for an hour with my bleach applied, now you would possibly think this was a boring hour, oh no !! earlier on I was offered a menu, as the salon has in house caterers, unfortunately for me I had dental work the day before so had to suffice with coffee while I watched the most beautiful trays of food and beverages being delivered to customers, I watched hair extensions being applied, a lady having a manicure and pedicure while her hair was being done, my hour of waiting went rather too fast, I was enjoying being nosy, at no stage was I left without being checked on, and at the end of my cooking period I was led to the basin, where I enjoyed Olaplex treatment a head massage and the grey toner being applied, the thing I found fascinating and something that I have to say has never occurred to be before, but my hair was treated with the exact delicate treatment that your skin would receive if you were having a facial, it was patted not rubbed, and treated gently at every stage. Next up it was the turn of the scissor magician Tom, the nicest friendliest guy ever ! he knew exactly what I wanted, pretty much what I already have but I needed a cut badly as I had been saving myself for this trip. Tom is like a scissor ninja, it was as though he cut and styled my hair under a spell, it was all done so seamlessly with what just came across as great skill on his part, no faffing or fussing it was just done ! 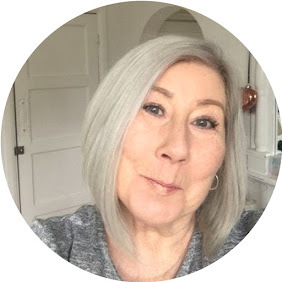 amazing- it was a real pleasure to watch a craftsman at work, he set about blow drying my locks into a glistening pale grey bob, that I couldn't actually believe was my own hair, STUNNED is an understatement ! Luci and Tom escorted me to reception ensuring I was happy, where I couldn't stop looking in the mirror and actually realising that this new look was mine ! Fortunately my new do wasn't wasted as I had an event to attend in London that evening, where a lot of familiar faces were as equally as impressed by my new hair as I was. To be honest I wasn't expecting anything really different to my usual hair but somehow it was transformed from my usual home colour to a work of art. Thank you once again Shirley, Luci and Tom if you ever read this, you literally made my day.